In David Fincher's 2002 thriller Panic Room, Jodie Foster and her daughter hide in a fortified closet when intruders break into their home. Breaking In is kind of a mirror opposite of that movie. It involves criminals taking over a high-tech house, while a panicked mother outside tries to gain entry in order to rescue her children. The flip isn't a bad idea, but that's unfortunately the only fresh element in the whole picture. Gabrielle Union plays Shaun Russell. She and her two kids, Jasmine (Ajiona Alexus) and Glover (Seth Carr), head to the home of her deceased father to get it ready for sale. They are surprised to discover that he had the place tricked out with all kinds of gizmos, including retractable walls that secure all the windows. Not long after they arrive, four criminals show up. Led by Eddie (Billy Burke), they're looking for a safe somewhere inside that contains four million dollars. Long story short, they take Jasmine and Glover hostage, leaving Shaun stuck outside. The protective mama then has to find a way to get through the fortifications and save her kids. 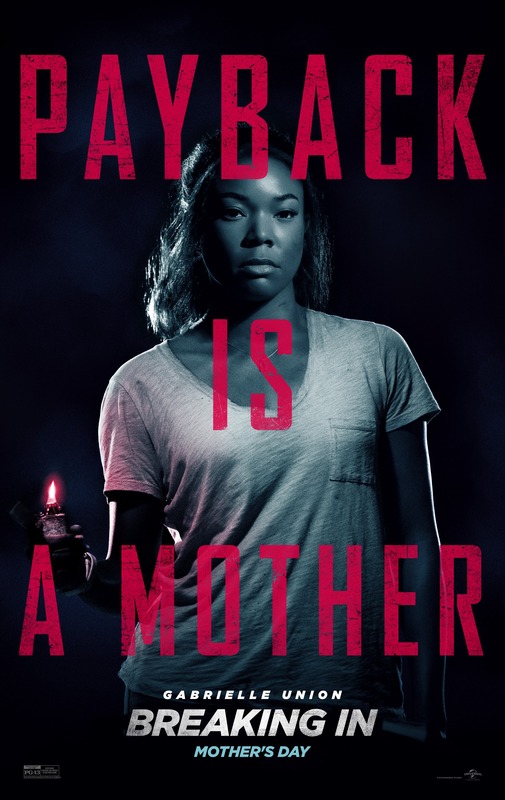 By far, the best thing about Breaking In is that it gives a strong leading role to the talented Gabrielle Union. Always a likable performer, she gets to sink her teeth into a fierce, determined character. Of course, Shaun goes through a variety of emotions – fear, panic, anger, sorrow, rage, etc. – during the course of the story. The actress earns our rooting interest every step of the way. Shaun is no victim. She fights back every bit as hard as Billy fights. This is the sort of role very rarely given to an African-American actress. Union knows that and doesn't hold back in taking advantage of it. Beyond that and solid supporting work from the rest of the cast, there's not much that stands out about Breaking In. The potential inherent in the idea of a high-tech house is barely taken advantage of. We keep waiting to see the characters utilize its capabilities in interesting ways, yet that rarely happens. Instead, we get standard stuff such as a scene where someone travels through a crawlspace, a rooftop fight, and a standoff in the backyard. Early on, Glover is shown playing with a drone, so we assume that it will later be used to get the upper hand on Eddie and the others. Nope. It's disappointing that Ryan Engle's screenplay doesn't exploit its central idea more. Without a complete utilization of its ostensible hook, there's little to do but notice some of the movie's weird touches, like the way Eddie and crew tend to stand around in the living room rather than actively looking for the safe. Or how director James McTeigue (V for Vendetta) allows the camera to repeatedly, gratuitously linger on Union's rear end. At least there's a cool scene in the finale where Shaun forces Eddie's hand in a clever manner. The film could have used more of that sort of thing. Running just 88 minutes including end credits, Breaking In breezes by amiably enough. It's fun to see Gabrielle Union play a woman who shouldn't be messed with, and these sorts of stories always have a certain What would I do in this situation? appeal. Nevertheless, the script generally opts to go the standard, formulaic route. A little more investment in the possibilities of a worried mother circumventing the tools of a high-tech abode might have elevated the movie into something special. Breaking In is rated PG-13 for violence, menace, bloody images, sexual references, and brief strong language. The running time is 1 hour and 28 minutes.